Marin Frist (Anne Heche) is a best-selling author and relationship coach who helps women find the right man, using her own life as an example. On a plane trip to attend an Alaskan conference, she finds out that her fiancee has been cheating on her and she realizes that she doesn’t know as much as she thought she did. Marin decides to stay in the remote town (where the ratio of men to women is 10 to one) so that she can truly learn how to find and keep a good man. 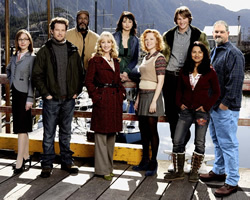 Characters include biologist Jack Slattery (James Tupper); Marin fans Annie O’Donnell (Emily Bergl) and Patrick Bachelor (Derek Richardson); Patrick’s mother, Police Chief Celia Bachelor (Cynthia Stevenson); pilot Buzz Washington (John Amos); Buzz’s wife Mai (Lauren Tom); bar owner Ben Jackson (Abraham Benrubi); Ben’s wife, barmaid Theresa (Sarah Strange); and single mother (via Ben) Sara Johnson (Suleka Mathew). Never got to see much of it but anything with Anne Heche deserves more of a chance than this one was given. I was so upset when they canceled this show.